Bullet cameras are great for outdoor uses. Aside from its durable and flexible casing, its long-range viewing capabilities made it much more suitable for external usage. And if you are looking for a great bullet camera, the Amcrest 4MP IP Camera WiFi UltraHD Wireless Outdoor Security Camera might be the one for you. Amcrest has become one of the most trusted security camera brands of today. For some reason, their actual business model today has become very effective to its consumers and partners. In fact, the company believes that their purpose and values towards their audience and users are the main reasons for their apparent success today. The Amcrest 4MP IP Camera WiFi UltraHD Wireless Outdoor Security Camera is one of the brand’s bestsellers. Although the company is offering a wide variety of security cameras, this bullet camera has been chosen by many actual users for their respective home security solutions. The Amcrest 4MP IP Camera WiFi UltraHD Wireless Outdoor Security Camera features the new Sony Sensor technology that ultimately allows the camera to provide vivid and vibrant image qualities. Along with these, it can also produce up to 4-Megapixel quality of images. As for its overall video resolution, users can widely experience the 2688x1520P rating which is quite above the average figure for a mid-range bullet security camera. In comparison to its current competitors, this kind of quality is pretty impressive already. If you are to check the KAANSKY and NextTrend Full HD Bullet cameras, they can only provide up to 1080P video resolution. So, it is really an edge for the Amcrest UltraHD Outdoor Bullet Camera. Many thanks to its Ambarella chipset, users can also fully see the output in a very clear and detailed way – pixel by pixel. And since this is a bullet type of security camera, it is only fitting that it can provide great image and video qualities. It is important for you to note that bullet cameras have this advantage over others because they are built to give efficient quality when it comes to the camera features. Hence, if a bullet camera cannot give you a high-quality type, then might as well look for other brands and varieties. Along with the high-resolution, the camera of the Amcrest WiFi UltraHD can also give the users a wide-angle view. The range of angle measurement that it can provide may reach up to 118 degrees. When you compare this with the other mid-range bullet cameras of today, you will notice that the Amcrest 4MP IP Camera WiFi UltraHD Wireless Outdoor Security Camera can give much wider angle measurement. For instance, Reolink 4MP Bullet Camera only features 80 degrees of wide viewing angle. Another great example is the NextTrend 1080P bullet camera which can only provide up to 72 degrees. Hence, it is in no doubt that users can really have a very wide viewing angle when the Amcrest 4MP IP Camera WiFi UltraHD Wireless Outdoor Security Camera is in use. Aside from the wide viewing angle, the night vision feature of the Amcrest 4MP IP Camera WiFi UltraHD Wireless Outdoor Security Camera is quite appealing too. In fact, it can reach up to 98 feet of total distance which is far beyond the total reach of other mid-range bullet cameras. Take Reolink 4MP bullet camera for instance – this bullet camera has a night vision function that can reach up to 80 feet only. As for NextTrend 1080P, it can only reach up to 65 feet of distance. In these figures, you will notice that the Amcrest 4MP IP Camera WiFi UltraHD Wireless Outdoor Security Camera has a very impressive night vision feature. More often than not, this kind of specification is usually found in bullet cameras with higher ranges of prices. So, if you are looking for an inexpensive bullet camera that can provide great night visions, this security camera from Amcrest might be the best choice for you. The motion detection feature of the Amcrest 4MP IP Camera WiFi UltraHD Wireless Outdoor Security Camera is one of the trickiest parts of this bullet camera. Apparently, there is an on-going issue with this feature as it is found that it cannot totally provide efficient detections. Many actual users today would experience several issues with the motion detection feature. Some users state that it is not the best aspect of the said camera. Others, on one hand, specifies that this feature is not really great since it is not reliable. Although there are still a few concerns about the motion detection feature, Amcrest believes that they are doing their bests to resolve the said issue. Theoretically, when the motion detection feature is enabled, it will detect every single motion or activity that it senses. Once they are detected, the system will then notify the owners or users of the camera through the dedicated application. This bullet camera from Amcrest is a wireless type. And it means that users can connect wirelessly the camera in their property’s wifi router to make it work. Accordingly, this is a great addition to the overall convenience of the said camera. But while it features a wireless connection, this kind of feature is already established in the security camera industry. In fact, most of the cameras today, even the entry-level ones, are already wireless. So, there is nothing really impressive about this feature. Even so, it still adds to the overall reliability and convenience which is great, especially for homeowners and users who are more inclined to using security cameras with no further complicated installation processes required. 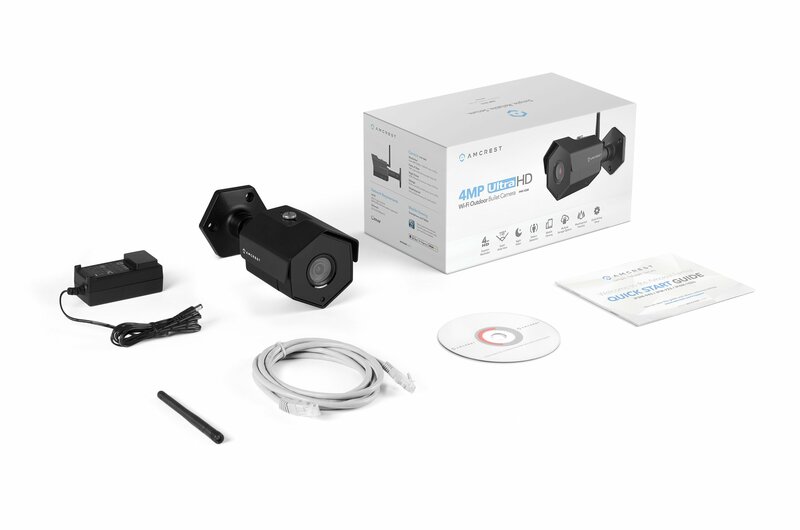 And with these things at hand, it is quite safe to say that when you choose the Amcrest 4MP IP Camera WiFi UltraHD Wireless Outdoor Security Camera, you will no longer need to have professional assistance or installers just to do the whole process. All you need to is to turn on the camera and download the dedicated application. Once you are settled with these steps, you can easily manage and configure the camera from there. After 3 to 5 minutes of wifi detection, the camera will then be connected to your home or property network. After the successful connection, you can then place the camera in the area where you intend to install it. However, just make sure that you have a near power source in that specific area since this camera does not work on battery. You will need a power source to make it all work. So, be wise in finding a place or position as to where you will install the camera. If you are wondering about the durability of the Amcrest 4MP IP Camera WiFi UltraHD Wireless Outdoor Security Camera, you can put your worry to ease since this camera features the IP67 Weatherproofing application. Certainly, you may have heard or read about the IP66 weatherproofing application. And many are actually impressed with this feature. But, if you are going to compare these two casing applications, you will see that the IP67 is much more effective than the IP66. In other words, IP67 is the much-improved version of the IP66. 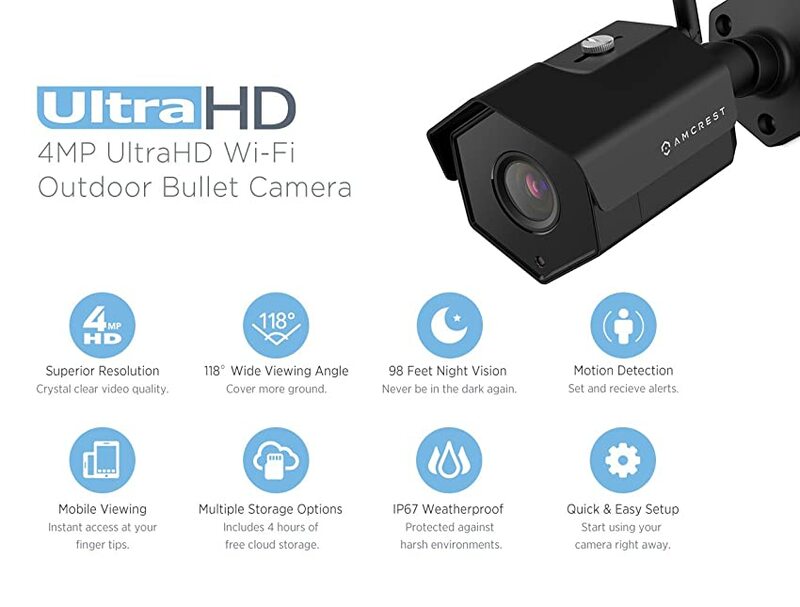 And if you are wondering about its efficiency, the Amcrest 4MP IP Camera WiFi UltraHD Wireless Outdoor Security Camera ensures its users and consumers that no matter what kind of weather and external element present in the surrounding, it will not affect or deteriorate the overall built and structure of the camera. So, if durability plays an important role in your buying decisions, then the Amcrest 4MP IP Camera WiFi UltraHD Wireless Outdoor Security Camera might be a great choice. Another thing that makes the Amcrest 4MP IP Camera WiFi UltraHD Wireless Outdoor Security Camera quite flexible and versatile is that this camera is compatible with Alexa. Many homeowners today seek cameras that are compatible with Alexa and this is because Alexa provides great assistance and convenience on their respective ends. And being an Alexa-compatible security camera, that is quite an advantage for the product. Along with the compatibility features, this bullet camera from Amcrest comes with a dedicated application – the Amcrest App. By and large, the Amcrest App is the main tool that you will need in order to configure and manage the whole system of the camera. Also, this is where the users will get the alerts and notifications when the motion detection feature is enabled. In addition, this dedicated application allows the users to remotely access the footages and screen captures of the camera. Hence, owners and users who travel a lot can benefit greatly from this feature. But while this aspect may appear to be very effective for some users, others, however, find the Amcrest App very limited and inconvenient. One apparent reason is that the application tends to freeze at times. Also, some users state that the app is not really giving them their actual needs when it comes to configuring the camera. Hence, additional workarounds are done in order to fulfill the overall function. One great example of workaround is the using of other camera apps like the Foscam App. It appears that the Amcrest 4MP IP Camera WiFi UltraHD Wireless Outdoor Security Camera is very compatible with the Foscam App. And many users find this partnership much more effective than the ones they have experienced with the Amcres App. But even so, this aspect is largely dependent on your personal preferences. So, you are free to choose whether you will utilize the free applications or not. The overall price of the Amcrest 4MP IP Camera WiFi UltraHD Wireless Outdoor Security Camera is rated below $150. For this price, you can already have a mid-range decent bullet camera along with the Quick Guide, 1-year Warranty Term, and lifetime support from Amcrest. Accordingly, the price point of the said camera specifically states that it belongs to the mid-range types. But, it is found that the Amcrest 4MP IP Camera WiFi UltraHD Wireless Outdoor Security Camera is not entirely cheap for a mid-range camera. Most mid-range type of cameras would have prices that range from $75 up to $100. And these deals are much more all-inclusive than this Amcrest package since most of them would already include the moutning brackets, cables, and tools. But for Amcrest, you will still need to purchase these necessary accessories to fully utilize the camera. Hence, it is quite safe to say that this is not an inexpensive camera. The Verdic: Is It The One? The Amcrest 4MP IP Camera WiFi UltraHD Wireless Outdoor Security Camera is a pretty decent mid-range bullet security camera. Some of its features including the camera quality and major functions are quite impressive. However, there are also a lot of drawbacks. And if price plays the biggest role in your buying decisions, then this camera might not be the best one for you since there are other cameras that can provide the same (or more advanced) features at a much lower cost. But if quality and compatibility functions are the things that you are more concerned with, then this might be the best one for you. Even so, your personal preferences will be the one that will matter in the end. So, be wise and practical in making your buying decisions.